Vivid abstract paintings hang in each room of the Mufarrij household and it is surprising how they harmonize so subtly their elegant traditional furniture. In a small back room furnished with a bed and a desk, Khalil Muffarij sits by the window, speaking with elegant, gentle gestures. This article was featured on the Daily Star’s website (www.dailystar.com.lb) on February the 18th, 2012, written by Sophia Tillie. Mufarrij was born in Beirut in 1947, the youngest and only son. As a young man he was an idealist and a committed Arab nationalist activist who felt that the Arab homeland needs to be modernized by revolutionary means. His role model was Kamal Ataturk, the founder of the Turkish republic. At 17, Mufarrij and some fellow AUB students founded the political movement Al-Shaab al-Raii (the idea-holders), which later developed into a broad-based student movement. Mufarrij obtained his BA in political science at the American University of Beirut in 1973. One semester before graduation, however, he was diagnosed with multiple sclerosis. This did not prevent his pursuing work in the Middle East and Europe but the MS’s creeping symptoms prevented his traveling to the U.S. and gradually bound him to this Broumana house. 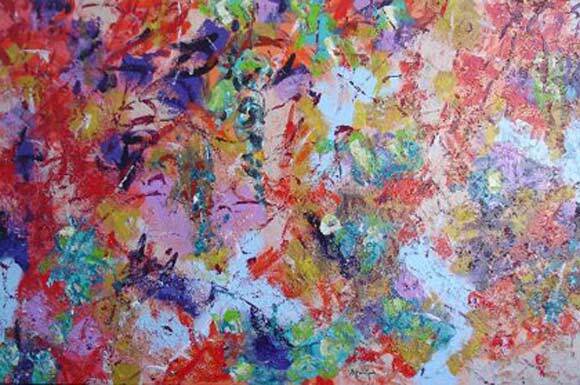 Here, starting in 1998, he chose a path of self-discovery through painting. It’s hard to find any traces of anger and sorrow in his paintings, which radiate luminosity of color and dynamism. Mufarrij received little formal instruction in the arts and his early works were pencil and pen-and-ink drawings on paper, mostly portraits. His drawings were personal commentaries, both descriptive and suggestive, but always perfectly coherent. He started experimenting with oil pastels in 2001 using them in some of this works in 2002. He was prolific from 1998 until 2002, completing an average of 17 pieces a year. After that he lost easy control of his pen and he dropped to two drawings a year, completing only one work in 2009. Mufarrij shifted to acrylic on canvas in 2003, creating representational, often figurative, works. Figuration gradually drained from his work after 2006 as MS took hold and in 2009 the work became totally abstract. He now produces a work every few weeks. His paintings are expressive, subjective and wildly spontaneous creations. As he drifted toward abstract expressionism, he entered a domain where straight lines and geometric form are supplanted by the dynamic energy of color. His paintings are the emotional response of a highly cultured spirit defiant of his bodily imprisonment. This is most evident in the internal dynamism of his painting, in the viscosity, speed and impact of his laying paint on canvas. His restless brush stokes seem to transgress these dualistic tensions. Yet what is most striking is how he manages to fuse this intensity and range of color with such speed without destroying or muddying the purity of his colors. Lebanese painting is renowned for its use of vivid and luminous colors, attributed to the quality of sunlight here. With his range of synchronized color combination, Mufarrij pushes the boundaries of color viscosity to a point where color seems to become sound. It is here that he enters unchartered territory. He says he never used to want to exhibit his work as he was not interested in the materialistic side of the art world. Art for him was therapeutic and he would give his paintings as gifts to friends and family.